In conjunction with our sister sites under the Force 12 Media umbrella, we here at FighterSweep are embarking on a pretty awesome adventure this month. Montana Congressman Ryan Zinke, a Navy SEAL veteran, introduced a resolution in the U.S. House of Representatives on 18 September, proposing October be designated Special Operations Appreciation Month. The whole idea is to raise the public’s awareness level about SOF, as well as show support for the “Quiet Professionals” and, more importantly, the unique sacrifices made by their families. “Too often our warriors do not get the recognition they deserve. From the mismanagement at the VA to the high rates of homelessness and unemployment, I know we can do more. I mentored young SEALs my entire career, and after retiring from the Navy, I wanted to continue serving them and their families,” said Zinke. So we decided today would be the appropriate day, since 3 October holds a special level of significance. 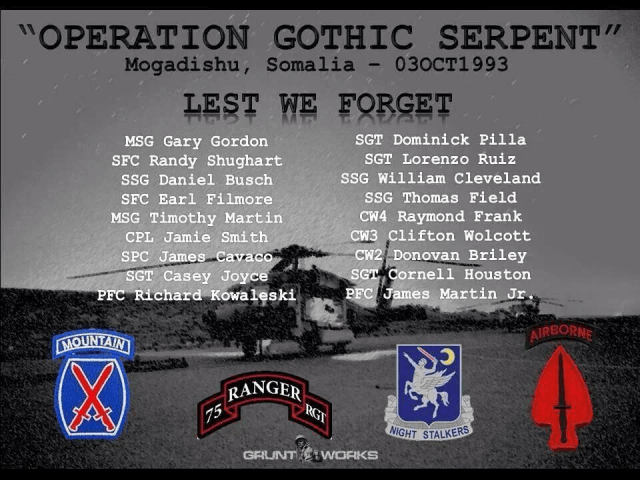 As many of you will recall, it was this day in 1993, during Operation Gothic Serpent, that a particular mission was launched during daylight hours to capture top lieutenants of warlord Mohamed Farrah Aidid in Mogadishu, Somalia. The mission in question, designed to take approximately an hour at most, turned into an eighteen-hour ordeal and resulted in what has come to be known as the “Battle of Mogadishu.” It was beautifully documented in Mark Bowden’s best-selling book, Blackhawk Down: A Story of Modern War, and a movie of the same title. Nineteen Americans died during that twenty-four-hour period, and 73 were wounded. Two of the 160th’s Blackhawks were shot out of the sky with Rocket Propelled Grenades. The day was wrought with extraordinary heroism, and even resulted in two Medals of Honor being (posthumously) presented to Sergeant First Class Randy Shugart and Master Sergeant Gary Gordon, both Special Operations snipers who defended one of two downed MH-60 Blackhawks to their last breath. The incident was a pivotal moment in the history of U.S. Special Operations, especially for the 160th, and the brave men who fought and died in Somlia are worthy of our gratitude, and our remembrance.